Delicious soup at the touch of a button? Yes, please! Life has been crazy. I would love to describe it in detail, but I’m still gathering the courage to share everything with you guys. It just feels weird to dump a bunch of sadness (Don’t worry, it’s nothing terrible!) in here when you are so used to my quirky and bubbly personality. The first thing that suffers when I’m feeling a little down are my eating habits. It’s not that I forget to eat, it’s just that I don’t have the energy to make anything, so I end up feeling even more depressed because I’m hungry. In fact, whenever I tell my husband “I’m not feeling great”, he replies: “You gotta eat!”. How does he know I ate nothing all day? ? So imagine my joy when I found out about this soup that is made at the touch of a button? Ok, maybe a little more then just the touch of a button, as you do have to open the pouch and insert the k-cup into the machine. But, c’mon? What could be easier than that? I know whatcha thinking. “Soup in my Keurig machine? That will either mean soup that tastes like coffee or coffee that tastes like soup!”. But you are wrong, my friend! The broth cups do not impact the flavor of your coffee at all and neither does the soup taste as if it was made in a coffee machine. It is pure magic, I know! Progresso recommends you run a cycle before making your next cup of coffee, but I didn’t (forgot!) and my coffee this morning tasted just fine. The Bistro Cups come in 3 delicious flavors: Broccoli & Cheese, Creamy Tomato & Parmesan and Southwestern-Style Creamy White Bean & Corn. I’ve tried them all and simply cannot pick a favorite! So I recommend you get them all so you can have a different flavor every day! Pair it with some crusty bread – or a sandwich, if you have the time/energy to make one – and it is the perfect easy comfort Fall/Winter meal. The Bistro Cups are also perfect on the go. Nowadays, lots of places have Keurigs (or other single serve brewers that accept k-cups): offices, hotels, schools, so you have no excuse to skip lunch or to be hungry! No need for pans, pots, ingredients, nothing. You don’t even need a spoon! All you need is a mug and your Bistro Cup. Pretty convenient, right? Oh how I wish this was available back when I was in college. I think I survived on potato chips (from the school snack machine) and cup noodles (that taste like nothing)! ? I also wouldn’t have gained the 20 lbs I gained during that time of my life… Oh well… No use in crying over the spilled milk, I guess. For now, Bistro Cups are only available in the Northeast U.S. Hopefully, they will be distributed nationwide soon, so make sure you keep an eye out! 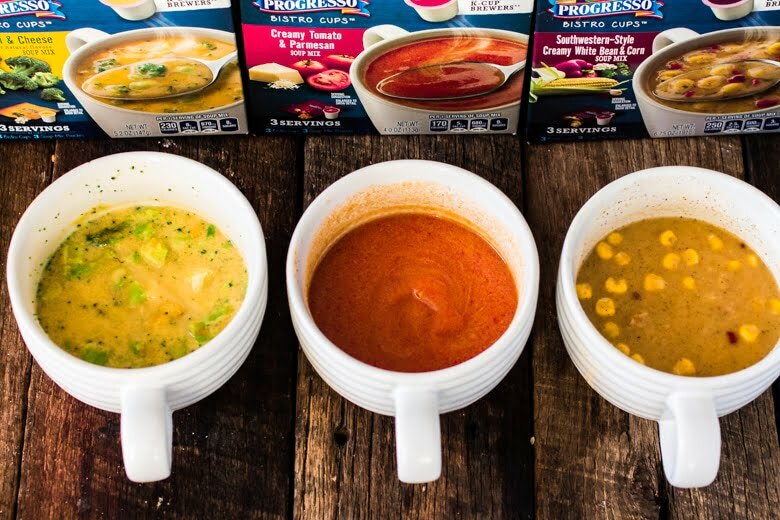 You can also visit Progresso Bistro Cups’ website to find out which retailers are carrying the product. Oh, and don’t forget to grab a $2 off coupon before you go! Have a lovely week rest of the week and don’t skip lunch! So yummy, my friend! 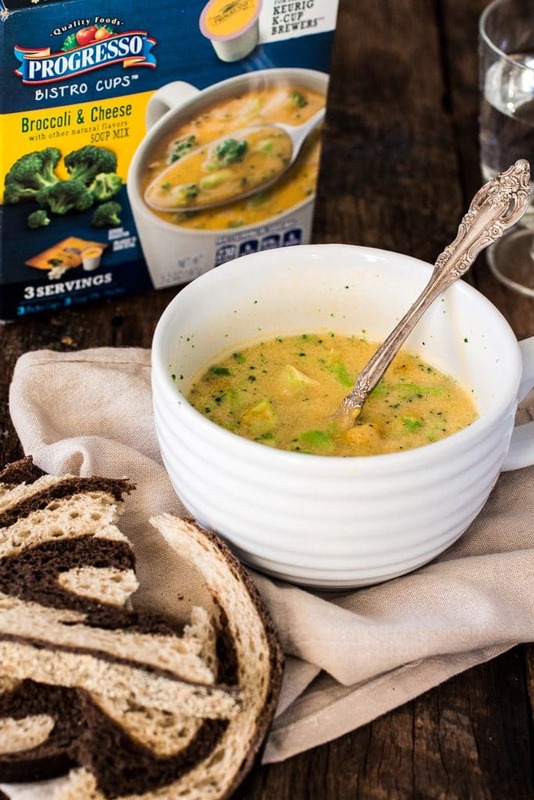 This soup is perfect for this time of the year!